This sampler pack makes a wonderful holiday gift or housewarming gift. 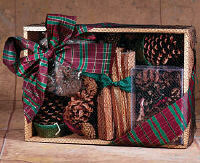 Fire Starter Oak Crate includes color cones, 4 pine cone fire starters, fatwood, and cinnamon potpourri. Color cones produce magical blue and green colors to appear in the flames.